Take a closer look at the interior features in the popular heavy-duty RAM 3500 pickup truck, you may decide this is the perfect vehicle for you. Even though the bed on the new RAM 3500 pickup truck is spacious, you may want a little more space to conceal certain belongings, The Built-in Rear Under-Seat Storage in the cab of the RAM 3500 is just the right size for storing your work equipment, your boots, or any equipment that is needed for your kids sporting events. 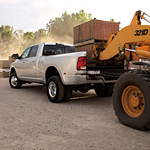 Downshifting and engine braking is that much easier in the RAM 3500 pickup truck thanks to the Electronic Range Select. Whether you are hauling a heavy load up a steep incline or pulling your boat down a hill to the marina, shifting to the right gear is easier. Come take the new RAM 3500 pickup truck for a test drive when you see us at Baumann Auto Center Chrysler Jeep Dodge RAM Port Clinton.